Cars and the engines that power them come in a wide variety of styles and configurations. The more I read and learn about cars, the more I believe that there is something magic about inline-6 engines. Many of the automotive greats have used the straight six engine, from the Jaguar E-Type to the Hudson Hornet to numerous BMW, Mercedes, and Jeep models. In general, inline sixes are known for being well-balanced with a smooth, even delivery of power. Though not high revving, they are reliable “workhorse” engines that can have a surprisingly long service life. Toyota had been producing inline 6 engines as early as 1955, but they really hit a home run with the introduction of the 2JZ family of engines, which were produced from 1991 to 1998 in the US (and through 2002 in Japan). This was the engine that powered the Lexus SC300, the first and second-gen GS 300, and an even more powerful variant went into the A80 Toyota Supra. Today, the 2JZ engine has a cult-like following. It is renowned among import car fans for its heavy-duty internals and its huge potential for tuning. 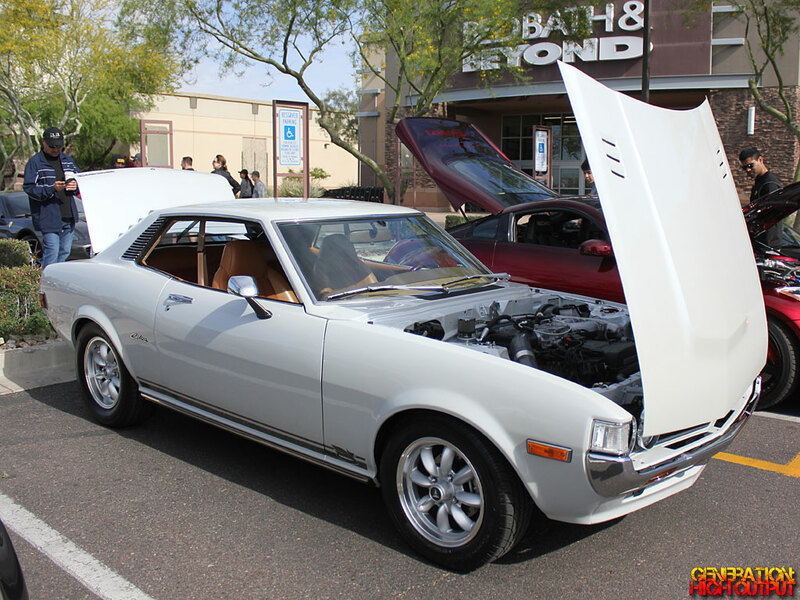 This is probably what motivated Arizona resident John Garza to swap a 2JZ-GE engine into his 1977 Toyota Celica coupe. I had seen this car in early 2017 at the Future Classics car show in Scottsdale, and crossed paths with it again at Cars and Coffee. The car has been featured in the October 2016 issue of Hemmings Sports & Exotic Car magazine, and gets a LOT of attention at local car meets and events. This 1977 is a close match to Mr. Garza’s first car, another ’77 Celica that he drove in high school. The Toyota Celica was recognized as Motor Trend’s Import Car of the Year in 1976. Under the hood, John has swapped in a 2JZ-GE mated to a 5-speed manual gearbox from a 2004 Lexus IS300. It’s an incredibly clean swap, and truly looks as if the engine came that way from the factory. However, getting it all to work was anything but easy. A page of build photos shows how John had to make some serious modifications to the crossmember and to the oil pan in order for everything to fit. The car borrows parts from the Toyota family, including the rear axle from a 1981 Supra and the steering box from a Corolla. Heavy modifications were also done to the car’s suspension in order to accommodate larger wheels and brakes. Rounding out the build is a wood and brown leather custom interior with all of the ambiance and warmth of a 1970s smoking lounge. It looks wonderfully comfortable, and is a welcome change from the typical Sparco seats and MOMO steering wheels that adorn most import builds. The combination of a classic car with modern performance and reliability is truly a win-win situation. We wish John many happy miles with his awesome car and hope to see it at more shows and events in the future! This entry was posted in Driven and tagged 2JZ, celica, engine swap, john garza, toyota celica by Trevor Freeman. Bookmark the permalink.